In general a stub area is used to reduce the number of LSAs in the Link-State Database (LSDB). The best way to think of a stub area is an area that does not provide transit for any other IGP or network connections. Multiple ABRs can be used within a stub area to attach the area to the OSPF domain. The logic behind a stub area is simple. Since all traffic to external networks goes through the ABRs and area zero, the ABRs for a stub area are the only ones who need routing information (type-5 LSAs) for those destinations. The other routers in the stub area can point a default to the ABR. Let’s lab it up and see what we have. Same topology as before but instead R4 redistributes the local networks (loopback interfaces) into area 2 with the redistribute connected subnets command. These will cause those routes to show up in area 3 as Type-5 external LSAs. Lets configure area 3 as a stub area and see how the LSDB changes. To save space Ill only show the configuration on R2 but remember all routers in the area must be configured as a stub. NOTE: Configuring any type of stub changes will drop your adjacencies so plan accordingly! First thing, we should check to make sure area 3 was properly setup as a stub. show ipv6 ospf will give you the same output as below for OSPFv3. As you can see under Area 3 it now shows "It is a stub area" You can also verify this on R3 and R5. What still don't believe me!?! Fine how about a packet capture. 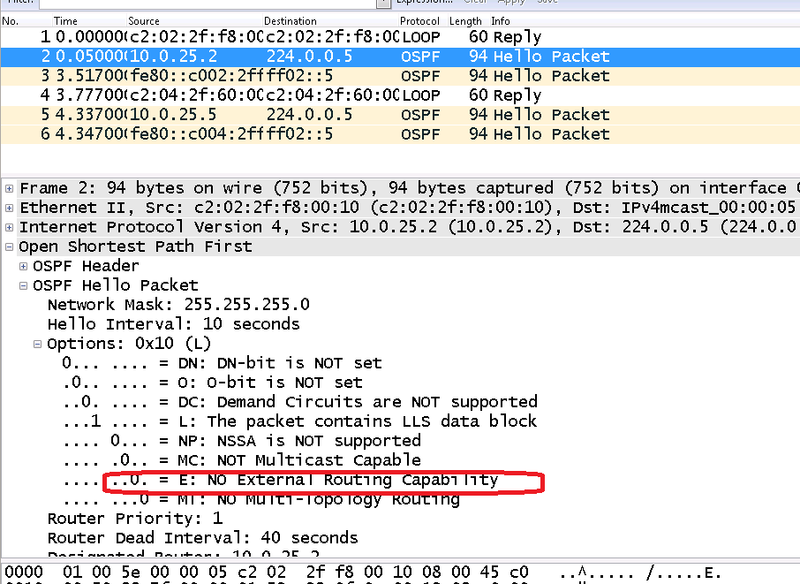 Both captures of the OSPF and OSPFv3 HELLO packets show in the options section the E-flag is set to 0. Remember if area 3 was not a stub area then the E-bit would be set to 1. Better! You can see both the Type-4 (Summary ASB LInk States) and the Type-5 external (Type-5 External Link States) are gone. You will also now see a default route (0.0.0.0) being advertised by both R2 and R3 under the Type-3 LSAs (Summary Net Link States). 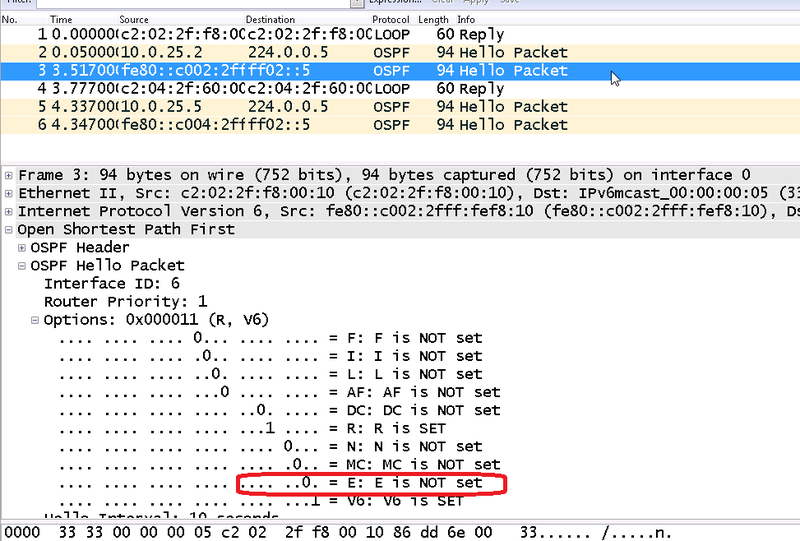 For IPv6 and OSPFv3 the result are very similar. That is it for stubs. Next up we will cover totally stubby areas and why you would want to use them compared to stub areas.